Slotris Classic Slot Review - Casino Answers! Slotris is a 3-reel, 1-line classic slot machine developed by Slotland Entertainment, featuring a sidegame and a progressive jackpot. You can play the Slotris classic slot machine at Slotland Casino. 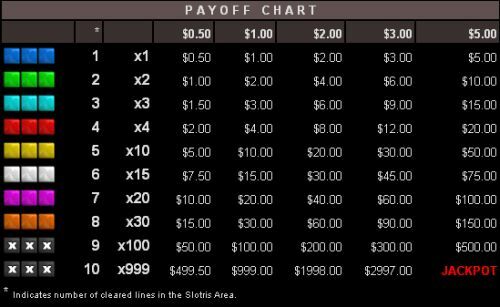 Bets on the Slotris slot machine are $0.50, $1, $2, $3 or $5 per spin. This is a decent betting range for a classic slot machine, although more options could certainly be available. Casino Answers recommends that you make the maximum bet of $5 per spin if you can afford it in order to be eligible for the progressive jackpot. To play the Slotris classic slot, select your bet and then carefully choose the order you wish the three blocks to appear in. Once you are happy with your selections, pull the lever at the right of the reels to play Slotris. Slotris’ main feature is the Slotris sidegame. The Slotris game area is located to the left of the reels. As you spin the reels on Slotris, you can choose the order of the three previous blocks that appeared and have them fall into place. If you fill a horizonital line with blocks (with no empty spaces), you will clear a horizontal line and win a payout. The more lines you clear (up to 10), the more you will win! Once you fill the Slotris Area to the top, the game will reset. The Slotris online slot game is linked to the progressive jackpot at Slotland Casino. At present, the Slotland Progressive Jackpot is at a tempting $62,566 and likely to end up much higher (that is, unless you win it first). To win this progressive jackpot, you must make the maximum bet of $5 per spin and clear 10 lines in the Slotris Area at the left. You can win the Slotland Progressive Jackpot by playing Slotris at Slotland Casino! How do I clear a line on the Slotris sidegame? In order to clear a line in Slotris, you must fill an entire horizontal line on the left side of the screen with blocks. The best way to do this is to look at your blocks and choose the best order for the three blocks to appear in. Can players from the United States play the Slotris slot machine? Absolutely! 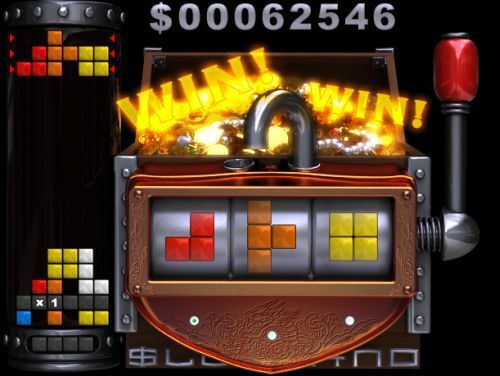 Players who are located in the United States of America can play the Slotris web-based slot machine at Slotland Casino. Do I need to download any software to play Slotris? Assuming you already have a web browser, the answer is no! You can play Slotris in your browser without download any online casino software. Can I play the Slotris slot game for free? Unfortunately, no. Slotris is only available to real money players at Slotland Casino. Are there any other puzzle game based slot games that I can play at online casinos? If a Tetris-based slot machine isn’t enough for you, you can also read our Bejeweled Slot Review, Cubis Slot Review and Jenga Slot Review. These casual slot games can be played along with Jewel Quest at [Americans: Unfortunately due to legal restrictions you are unable to play at any of the online casinos this game is at. We recommend you trying playing the unique slots at Win A Day Casino instead. ].